Before we were married, my husband lived in Croatia for a few years and served a mission for our church. He came back to the United States with a love of Mediterranean food and has made a couple of dishes over the years that have been so delicious! I love that they use a lot of fresh herbs and simple ingredients to give their recipes maximum flavor. 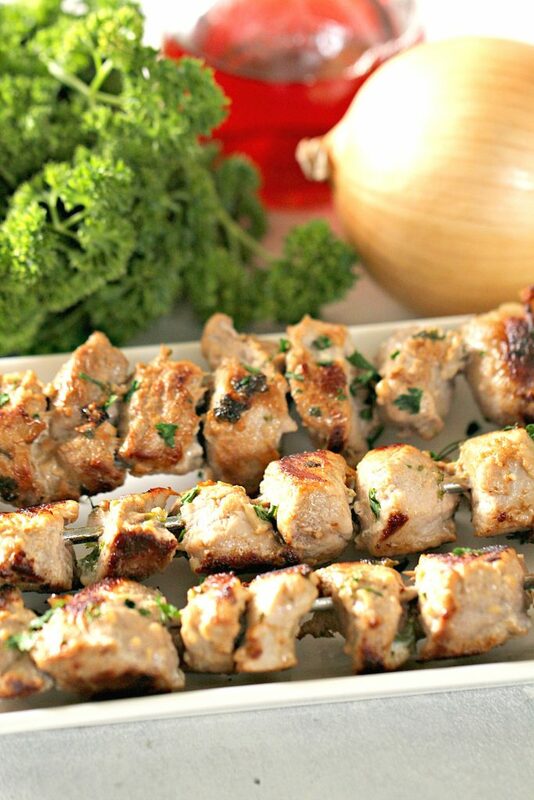 This grilled pork is called “raznjici” in Croatia, which literally translates to shish-kabob. My husband helped me prep the recipe and I loved that it was all ingredients that I had in my pantry and fridge. I purchased a pork loin at the store and cut it into chunks that were a little bigger than bite-sized (you can really make them whatever size you want, just try to make them all the same size so that they cook evenly). I then mixed all the marinade ingredients together in a gallon-sized resealable bag and added in the pork pieces. I recommend that you let it marinade for at least 4 hours, but 8-10 hours gives you even better flavor. When the meat is finished marinating, skewer the meat on metal or wooden skewers. If you are using wooden skewers, be sure to soak the skewers in water for 30 minutes first to prevent them from burning. Drain off the marinade and grill for a couple of minutes on each side or until the pork is cooked all the way through. In Croatia, my husband says that they serve these skewers with a simple soup or salad, fresh crusty bread, and possibly some French fries (they love french fries with everything). Check out our Homemade Baked Steak Fries and our Spring Salad with Homemade Dressing for quick and easy side dishes that pair well with this pork! If you need more easy meal ideas, be sure to check out our Weekly Healthy Menu Plan where we email you 6 dinner recipes, 2 side dish recipes, and 1 dessert recipe each week! Your family dinners will never be the same! ? In a gallon-sized resealable bag, mix together red wine vinegar, vegetable oil, onions, garlic and parsley. Add pork to bag and marinate in the fridge for at least 4 hours (8-10 hours for maximum flavor). If using wooden skewers, let soak in water for 30 minutes. 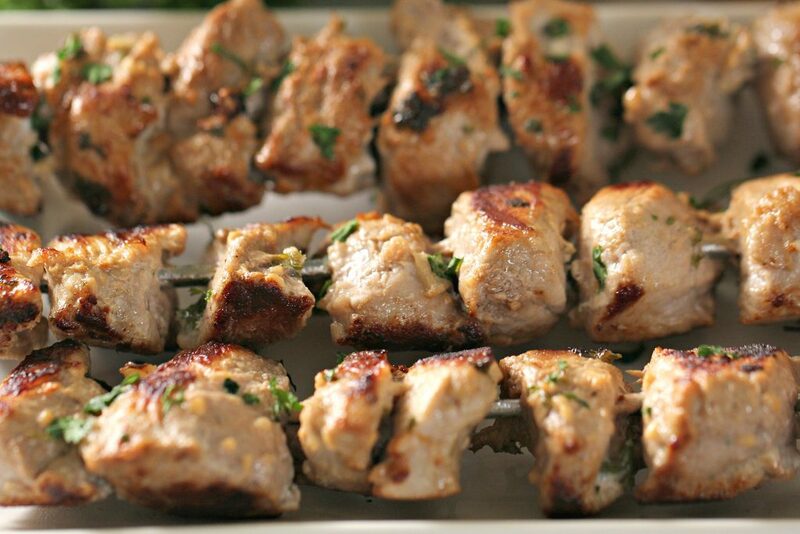 Remove pork from marinade and thread onto skewers, packing them tightly. Generously season pork with salt and pepper. Grill pork for 3-4 minutes on each side or until pork is cooked thoroughly. Oh. My. Word. These were amazing!! So tender and flavorful. I wouldn’t be upset if you changed the serving size to 1 so I could eat them all to myself! I served with Parmesan couscous and a spinach salad. Yum!